All of us know of someone or have heard of someone in their eighties and nineties and is as sharp as a tack. And yet, many of us also know of someone who is significantly younger and in some state of cognitive decline. As we age, all of us will experience some degree of decline in our cognitive capacity. The level of decline can vary widely from mild forgetfulness to late-stage dementia. Alzheimer’s Disease, the most common form of dementia, is the 6th leading cause of death in the U.S.
I’m not sure what’s more frightening: that the number of people affected by Alzheimer’s is expected to triple in the next thirty years, or that the scientific community hasn’t been able to agree upon the causes of cognitive decline. Not only can we not find a definitive cause for cognitive decline, current treatments are not proving to be very successful. For example, if you perform a CT scan on someone with Alzheimer’s you will find abnormalities in their brain called amyloid plaques. These are clumps of proteins that form between the brain’s neurons and disrupt cell function. In the past, it was assumed that the plaques were the reason for dementia. Therefore, many treatments focused on treating the plaques. Unfortunately, this approach has not proven to be very effective. Now, there is evidence that the plaques might not be a cause of dementia – rather they are just another symptom. It is believed that there is some other underlying process that is occurring in the brain that is creating the symptoms of dementia, one of which is the appearance of plaques. It could be that the formation of plaque is actually the brain’s way of protecting itself. But what is it protecting itself from? 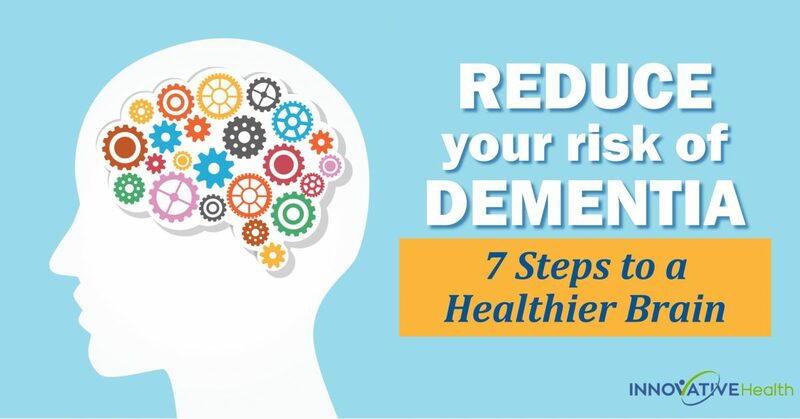 Understanding that answer will be the key to successfully treating and preventing dementia. It’s tough to know how to prevent something when you don’t fully understand its true cause. But there are two important things that we do know about brain health. We know that people who live in places known as Blue Zones have lower levels of dementia. We also know that people who have higher levels of a super-protein called BDNF have lower levels of dementia. Recent research has uncovered 5 geographical areas around the world where people live well into old age and suffer very little chronic disease – including dementia. These areas, dubbed “Blue Zones,” are Okinawa, Japan; Sardinia, Italy; Nicoya, Costa Rica; Ikaria, Greece, and Loma Linda, California. People who live in the Blue Zones live the longer, healthier lives than the rest of the world. What do these 5 areas all have in common? According to the data, it’s lifestyle. People who live in Blue Zones get moderate but consistent exercise. They have a moderate caloric intake. They have a diet primarily focused on plants. They consume moderate amounts of polyphenol-rich alcohol (polyphenols are the phytonutrients in plants that give them their color). These people have an absence or reduction in stress and a purpose in life that revolves around social engagement, spiritual engagement, and relationships with family. According to the research, another significant factor in the connection between lifestyle and cognitive health is a protein known as BDNF. Brain-derived neurotropic factor (BDNF) is a specific protein found in the brain. It is one of the most important neuroproteins that’s been discovered in history of neurology to date. BDNF promotes the survival of nerve cells (neurons) by assisting in the growth, development, and maintenance of the cells in the brain. It is active in the brain’s synapses where cell-to-cell communication takes place and helps create new connections in the brain. It plays a critical role in neurotransmitter balance, and thus in the protection and regeneration of brain cells. You could think of it as a growth hormone for your brain. The good news is that there are several things that we can do everyday to make sure that we are producing this brain-building super protein naturally. Not surprisingly, these lifestyle factors mirror those who live in the Blue Zones. Exercise: Those who live in Blue Zones enjoy consistent, moderate exercise as a part of their daily living. They walk to destinations, work in their gardens, and generally perform more manual labor in daily life. Find ways to naturally incorporate more exercise into your daily routine. Sleep: Getting the proper amount of deep sleep is critical to healthy brain function. As we age, deep sleep decreases, so it’s important to make sure we’re getting enough sleep in total to ensure proper amounts of deep sleep. Exercise, a sleep routine, avoiding caffeine, and minimizing the use of electronics and screens can help you get a better night’s sleep. Stress Reduction: Everyone experiences stress. But the world’s healthiest people reduce stress as a part of their daily routine. Meditation, specifically, has been shown to increase BDNF levels. Find a way to incorporate quiet reflection, prayer, mindfulness, or other calming activity into your life. Sunshine: Sunlight provides two key benefits relative to cognitive health. First, it helps to bathe the pineal gland inside the brain for better bio rhythms throughout the body. Why is this important? Think about the last time your sleep pattern was interrupted and the impact it had on your mood and memory. A second key benefit of sunlight is that it produces vitamin D3, proper levels of which are associated with boosting mood and preserving memory. Polyphenols: Polyphenols (micronutrients found in certain plant-based foods) have been found to help fight neurodegenerative disease. They can be found in things like beans, berries, dark chocolate, cloves, nuts, turmeric, green tea, and grape seeds. Certain vegetables including broccoli, onions, spinach, and tomatoes all are high in polyphenols. Eating Proper Fats: Cell membranes are surrounded and protected by a fatty layer. The types of fats in that layer play a critical role in cellular health, so it’s important to consume the right types of fats to keep your brain cells healthy and functioning properly. A general rule of thumb is to consume more Omega 3 and Omega 9 fatty acids and fewer Omega 6 fatty acids. Omega 3s are commonly found in cold water fish, flax seeds, walnuts, broccoli, cauliflower, and some spices (oregano, cloves, basil, and marjoram). Omega 9s are found in olive oil, avocado, and raw nuts (except peanuts). Omega 6s are also essential to brain function, but the typical diet has us eating far too many of them. So much so, that they can have a negative effect. Therefore, we should limit the fats we consume from common cooking oils (soybean, sunflower, peanut, corn, and canola) as well as egg yolks and corn-fed meats. Community: Humans are genetically hard wired to crave social interaction. Joining a community keeps us connected to others and provides a sense of being a part of something greater than ourselves. It has also been shown to increase levels of BDNF. There are many different types of communities: family, friends, faith-based communities, civic organizations, social clubs, neighborhood groups, book clubs, sporting organizations, the list goes on. Find a community in which you can develop meaningful relationships and be socially engaged. Some of these recommendations may be easy to incorporate into your daily life. Others may not be. Changing your lifestyle – the way that you LIVE – is not a simple task. It involves making many small changes along the way to a bigger goal. It truly is a journey. In addition, everyone of us brings our own unique challenges to the table. You may already have some health concerns and risk factors that impact your journey. Some people may be at higher risk for anxiety and depression. Others may have issues with metabolic syndrome and insulin resistance. Even medications sometimes need to be addressed. For example, did you know that statin medications have now been correlated with an increased risk of Alzheimer’s Disease. So how do you know which are the proper steps for YOU to take on your journey to health? As a Functional Medicine practitioner, I understand that each person comes with their own set of health concerns and risks. It’s my job to sit down with you, go over your own personal risk factors, and develop a plan to manage those risks. Declining brain function does not have to be a part of aging. There are steps each of us can take to put ourselves in the best position to stay healthy for years to come. There may be no magic pill, but there is certainly an answer. Dr. Kevin Ritzenthaler, DC, DCBCN, is a Functional Medicine practitioner, diplomate in clinical nutrition, chiropractor, and owner of Innovative Health in Weston, Wisconsin. He can be reached at 715-355-4224 or via www.InnovativeHealthClinic.com. Initial consultations are always free of charge.